Guyana’s Superbike champion Stephen Vieira seen astride his Yamaha R6 at Bushy Park Circuit during the first leg of the CMRC. 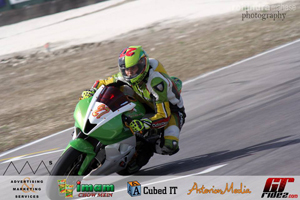 Guyana and Caribbean Superbike champion Stephen Vieira showed that he has lost none of his skills when he raced to first and second places during the opening leg of the Caribbean Motor Racing Championship (CMRC) last month, at Bushy Park Circuit in Barbados. Vieira when contacted by this newspaper to comment on his performance in Barbados said it was the fanswho inspired him to race in the first place and then their overwhelming support that gave him the confidence to perform the way he did. Vieira said he received the machine one day before race day and was contemplating whether or not to compete since he did not get the opportunity to attend the qualifying session and would have therefore had to start at the back of the grid. “I was in two minds whether or not to ride, but the encouragement from my fans both at home and in Barbados gave me the drive to go out there and give it my all and the results speak for themselves,” Vieira said. In describing his performance, Vieira recounted he had to start at the back of the grid in the first race and worked his way up the field to finish second behind Guyana’s Nikhil Seereeram, but got the opportunity to reverse the positions in the second race to crown a solid performance. Vieira was thankful for the support offered by his main sponsor Sunburst and Rakesh Puri of Continental Agencies, who he said has stood behind him for many years, Team Manager Udoh Kanu and his team of mechanics that include Smellie and Ezzie. Vieira’s dominance was of such that he registered a new lap record for the Superbike category at Bushy Park which now stands at 1.05:418. He indicated that he is eagerly looking forward to competing in the rest of the Saeries and was confident that he will retain his title as the best in the Caribbean.